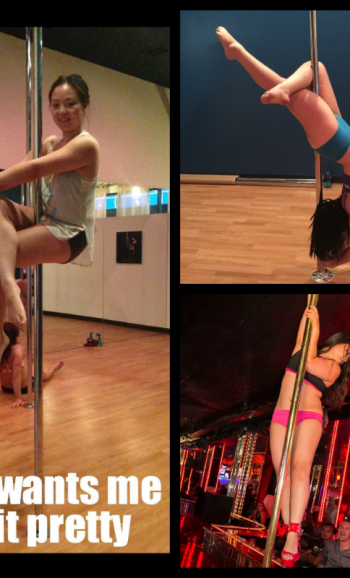 Pole dancing has not only opened the door to fitness for me, it also changed my life. It helped me realize that my body is amazing. Sandy has been with Inversion Dance Studios since 2013. Prior to pole dancing, she was pretty much a couch potato with neither athletic nor gymnastics background, and nothing could motivate her to become active. One day, she decided to look for a fun workout, and she found Inversion. It was love at first class for her. Although she accomplished nothing during her first class–couldn’t levitate, could only do one climb–she still enjoyed it very much. Finally, she climbed all the way to the top after a month despite all the pole kisses (bruises) on her legs, and the rest is history. She has performed in several of Inversion’s free-dance nights and events, and three times at Cheetahs in Hollywood. “Pole dancing has not only opened the door to fitness for me, it also changed my life. It helped me realize that my body is amazing,” she says. When she travels, she likes to go to pole dance studios in different countries. Besides pole, she also enjoys a wide variety of exercises such as indoor rock climbing, aerial silk/lyra, yoga, and Pilates. Although cardio is still her greatest enemy, she’s currently taking the Pilates instructor certification program at Mt. San Antonio College so she can help more people become fit and healthy.